In early December, we launched the first version of Indy Hall’s Code of Conduct. Since publishing, I’ve had a number of great conversations with community members about questions and context. Each of these conversations has been a valuable exploration of my own understanding of why this new document is and will be valuable, and what we’re hoping to accomplish as it evolves. So I decided to write down what I’ve been sharing with others in hopes that it can help others who I haven’t talked to directly, and prompt further discussion both at Indy Hall and in the wider coworking movement. This post started as more of a Q&A, but I realized that there was story followed my own ability to answer the questions, so I wanted to share the context of my own learning at the same time. Last summer, Sam Abrams (one of my Indy Hall teammates) invited Sarah Carter to speak at our second annual People at Work Summit conference. Sarah spoke to us and around 100 other coworking leaders about active steps we could take towards being more inclusive, and which biases and blindnesses we may need to overcome to do so. This talk was a highlight of the conference for many, and a big eye-opener for a lot of us. Promoting inclusion and respect of all individuals. Initially, this list felt so deeply in Indy Hall’s DNA to me. It felt like what we already do, what we espouse, and how we’ve always operated. But in the past year, I’ve come to realize that it’s a helluva lot easier to feel that way when you’ve already been on the receiving end of being celebrated, understood, and respected. In spite of our membership being nearly 50% women, only 20% of our full time membership is female (that’s 13 out of 63). In spite of Philadelphia being a dominantly non-white population, Indy Hall very poorly represents the ethnic diversity of our city. Our average age has trended up, but I’d estimate that we still average in our mid-to-late 30’s. And that’s also just a few of the more visible parts of anyone’s identity. We know from experience that every single member of our community has more to them than is obvious on first glance and there is so much to an individual’s identity that isn’t obvious at first. So I’ve started thinking about this in the context of Sarah’s slides. What can we do to help someone be certain that this is a place where they will be celebrated, understood, and respected, too? And what should we do when the opposite is true, in spite of our best intentions? “I want [every student] to feel that they’re part of a community—one community—that not only respects but embraces difference in all its guises: racial, ethnic, sexual, gender, ability, and socioeconomic—and all the amazing intersections that make up our Rochester community. We typically talk about this in terms of diversity and inclusion, diversity of background, diversity of opinions, and everyone feeling that they’re included. However, I’m starting to prefer the language of “belonging.” This institution belongs to all of us. If you’re here, you belong here. This is YOUR institution. This is subtly different from inclusion, which still implies that something from the outside is in some sense inserted, or added, to something that already exists. Belonging means that someone here is an equal member. Belonging has a kind of an “ownership” feel: the institution belongs to us all. I want everyone here not only to know they belong, but to feel they do. It is THEIR institution. I think that many members of Indy Hall community and supporters would nod along with this idea. Among the things that have made our community strong over the years is that sense of ownership. I’d go so far as to say it’s what we’re known for. But what if you don’t see people like you feeling that sense of ownership? And what happens when someone (knowingly or not) undermines your sense of ownership? It’s very difficult to feel a complete sense of ownership when you also feel ignored or unsafe. 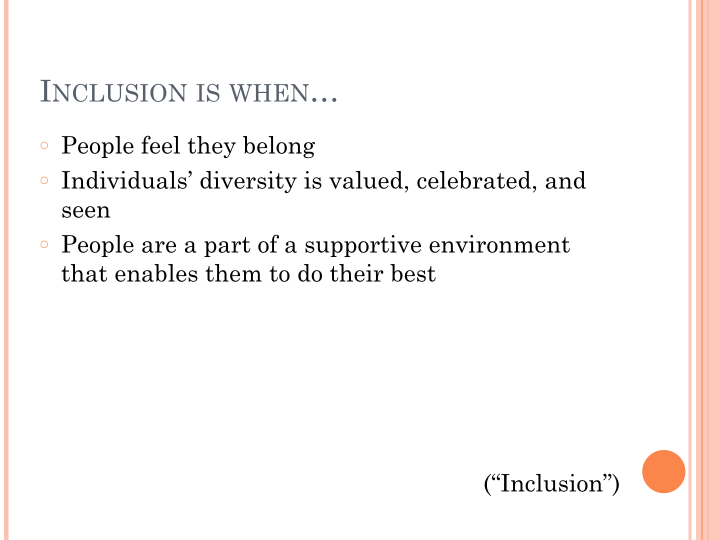 So after hearing Sarah Carter’s talk, Sam took the lead on doing some research into how other coworking spaces, community organizations, and conferences implemented visible, actionable tools that encourage a diverse, inclusion, and that sense of belonging. Quickly, she found was that while CoC’s have become increasingly common – and in some cases demanded – at professional conferences, very few coworking spaces had an explicit (or public) code of conduct at all. And Indy Hall was one of them. Sam wasn’t the first person to suggest that Indy Hall should have a code of conduct, and to her credit (and my embarrassment) this wasn’t even the first time she’d suggested it. But this time, I started to understand a code of conduct as a tool for specifically and clearly communicating something that I had intended all along but wasn’t saying out loud. We wanted to figure out how to say this out loud and in writing, and in a way that gives someone the confidence that they can belong, too. So we set the goal of creating our own before the end of 2017. During her research, Sam had also found that it was surprisingly difficult to find good examples of a coworking-centric code of conduct. They’re out there…but most didn’t quite resonate with our objectives. So true to Indy Hall form, we were able to turn to our community’s expertise! We learned a ton from Indy Hall members who have experience developing these kinds of documents for meetup communities, university settings, and even the nonprofit organization behind the massive community-edited Wikipedia. In December, Sam shared the first draft of our Code of Conduct with the Indy Hall community for additional feedback and questions. Indy Hall’s code of conduct is now visible here and is referenced prominently in multiple points of during new member onboarding. And when we launch a (long overdue) updated website, the plan is to make this code of conduct even more visible to the public. Might we work with this Code draft so that it could easily be read aloud? I feel that written things that are easy and/or pleasant to read are more likely to be understood, taken to heart/followed… right now, it’s really chilly writing, which of course comes from the topic a bit. Maybe even more importantly is how the Code of Conduct is upheld. I will admit that I was concerned about how a CoC would turn us into the “conduct police” but even just writing that down makes me realize how much worse it is to have ZERO mechanism in place for when something goes wrong. Said another way: I’d rather have this thing and never have to use it, than need it and have nothing to use. Instead, we’re taking this as an opportunity to be equally intentional about how we respond. The response team includes a mix of our core team (myself, Sam, and Adam) as well as a rotating team of volunteers from the community. The goal is to make it clear that any member of Indy Hall has a clear path for asking for help with resolution, and they have a way of choosing who they get that help from. Our goal is to create safe channels for discussing the problem and looking for ways to resolve them. We’re also researching alternative models like restorative justice for guiding resolutions in ways that are more in line with Indy Hall’s values of treating responsible adults like responsible adults, rather than defaulting to punitive measures. And already, having this document has opened the door for valuable conversations with members about issues they’ve had. I’ve never been so naive as to think that these issues weren’t happening, but I think I mistakenly expected people to just come talk to me if they did. Knowing that the Code of Conduct may have played a small role in people feeling comfortable asking for help – or even just knowing they can come to someone in confidence. Having a Code of Conduct does not supersede or “undo” any of our existing core values or expressions of who we are. Instead, this should add additional depth and dimension to our core values by making existing expectations more clear, and reducing opportunities for confusion & hurt.Our core expectations of “take care of yourself, each other, and this place” are still the rule of thumb. If there’s ever doubt in what that means, we can use the CoC as a guide. A Code of Conduct helps promote communication and transparency. Bad things can and will happen, and a CoC doesn’t prevent that. Instead, having a CoC encourages people to speak up when something is wrong so it can be addressed.Especially during tough transitions, I commonly repeat “If anything is unclear or you’re worried about something I said, you can come talk to me” but I’ve realized that a more explicit invitation and channel for communication only serves to promote that trust more.The best I can promise to do is listen and work to understand. There’s no single event, or experience, or complaint, that triggered this as a reaction. I think this is the most common question we got when sharing the first draft of the CoC. The answer is no, this is not a response to any specific thing including the public reckoning with sexism that many industries underwent during 2017.Accessibility is a core value of Indy Hall and the original coworking movement. My own understanding of what “access” can mean has changed over the years to include more nuance, especially as we’ve grown. Finally, I want to credit Sam Abrams for her leadership on developing this particular tool towards a more accessible and inclusive Indy Hall, as well as the support that she garnered from members who had experience with CoC’s. And if reading about my experience sparked you to consider creating (or re-thinking) your own Code of Conduct, Sam recommended this anti-harassment resource as a valuable starting point. I’m very excited for this year. At the end of 2017 we experienced a bit of a homecoming as a bunch of long-time members returned from time away to re-embed themselves in the Indy Hall community. The last couple of years feel like they’ve been infrastructure focused. In 2015 we learned we were going to have to move. In 2016, we found a new home. For the first time, we designed a space just for us. We solved long-standing problems like where to take phone calls and host meetings. Just about everything about Indy Hall got a little bit better, and a few things got a LOT better. In 2017, we learned to adapt to our new surroundings. We worked on getting back to our roots, of doing what we do best: helping awesome people find and help each other. Then we grew our physical space by another 50%. For the first time, we started creating the tools to support certain kinds of small teams as they flourished within Indy Hall. And of course, we drafted this Code of Conduct. I want to think of 2018 as an invitation. To you. To make Indy Hall yours. If you’re here, you belong here. This is YOUR institution. Wanna come say hi at Indy Hall, or catch up over a cup of coffee? RSVP for our free monthly “Open Hall” days on First Fridays (RSVP here for Friday January 5th) or just shoot an email to [email protected] and ask about scheduling a visit.